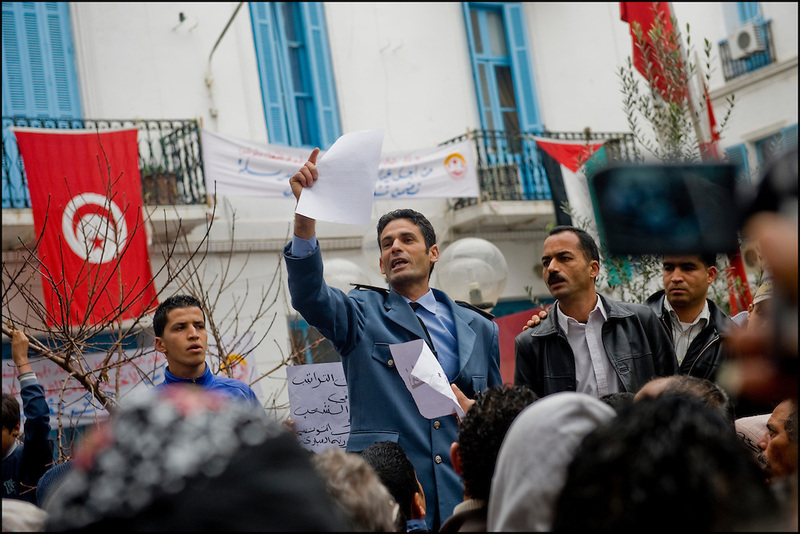 A group of protesters are gathered in front of the UGTT (Union Générale des Travailleurs Tunisiens) building and listen to a municipal agent responsable for collecting taxes in the city, he decided to join and adress the protesters to encourage the protest on January 25, 2011. Copyright Benjamin Girette /// On january the 14th 2011, Zine el-Abidine Ben Ali President of Tunisia and his famous wife Leila Trabelsi as know as "The regent of Carthage" are forced by thousands of protesters to escape the country after 24 years of power. As a result a new democraty is in design for the next six months until Tunisians organize national democratic elections, it might be the birth of the first democraty in the arab world..